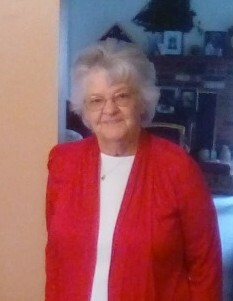 Thelma L. Woodward Profit, 82, or rural Republic, died at her home on Thursday, August 30, 2018. Thelma was born in Narland, Virginia on March 9, 1936 to the now deceased Hardy and Cynthia V.A. (Mullins) Mullins. She was a member of Calvary Baptist Church in Clyde. Mrs. Woodward Profitt enjoyed crocheting, quilting and gardening. She was always happy to travel. On April 2, 2017, she married David R. Profitt. He survives, along with her children, Andrew (Angela) Elam of Port Clinton; James Wesley (Barbara) Woodward of Fremont, Ricky Lynn (Helen) Woodward of Lindsey and Sandra Kay Woodward Stilitner of Bloomville. Also, David's children, Lloyd A. Profitt of Republic; Linda C. Profitt of Minot ND; Denise A. Profitt of Green Springs and David Edward Profitt of Bellevue. Eight grandchildren, six step grandchildren 21 great grandchildren, as well as her siblings Delores Carty of Colburn, VA; Joyce Mullins of Spring City, TN; Marlene Brooks of Clintwood, VA; Walter Mullins of Tampa, Fla; and Jequeta Briskey of Stryker. Thelma was preceded in death by her first husband, Richard J. Woodward and a great grandchild. Visitation will be on Wednesday, September 5, 2018 from 11:00 am until the service at noon at Mitchell-Auxter Funeral Home, 218 South Main St., Clyde, Ohio. Burial will be in Butternut Ridge Cemetery. Thelma requested that in lieu of flowers, please donate to her great nephew, Charles Ruger Lynn Dannel of Tennessee to search for a diagnosis. Any contributions may be given to Thelma's family.